The Blue Mosque (Called Sultanahmet Camii in Turkish) is an historical mosque in Istanbul. The mosque is known as the Blue Mosque because of blue tiles surrounding the walls of interior design.Mosque was built between 1609 and 1616 years, during the rule of Ahmed I. just like many other mosques, it also comprises a tomb of the founder, a madrasa and a hospice.Besides still used as a mosque, the Sultan Ahmed Mosque has also become a popular tourist attraction in Istanbul. Best way to see great architecture of the Blue Mosque is to approach it from the Hippodrome. (West side of the mosque) As if you are non-Muslim visitor, you also have to use same direction to enter the Mosque. Following the Peace of Zsitvatorok (1606) and the unfavourable result of the wars with Persia, Sultan Ahmed I decided to build a huge mosque in Istanbul. It would be the first great imperial mosque to be built in more than forty years.His predecessors had paid for their mosques with their war booty, Sultan Ahmed I had to withdraw the funds from the treasury, because he had not won any notable victories during his time. This provoked the anger of the Ottoman ulema, the Muslim legal scholars. The mosque was to be built on the site of the palace of the Byzantine emperors, facing the Hagia Sophia (at that time it was most venerated mosque in Istanbul) and the hippodrome, a site of great symbolic significance. Large parts of the southern side of the mosque rest on the foundation and vaults of the Great Palace. Several palaces was already built there, most notably the palace of Sokollu Mehmet Pasha, so these first had to be bought at a considerable cost and pulled down. Large parts of the Sphendone (curved tribune with U-shaped structure of the hippodrome) were also removed to make room for the new mosque. Construction of the mosque started in August 1609 when the sultan himself came to break the first sod. It was his intention that this would become the first mosque of his empire. He did appoint his royal architect Sedefhar Mehmet Ağa, a pupil and senior assistant of the famous architect Mimar Sinan to be in charge of the Mosque construction. The organization of the work was described in meticulous detail in eight volumes, now found in the library of the Topkapı Palace. The opening ceremonies were held in 1617 . 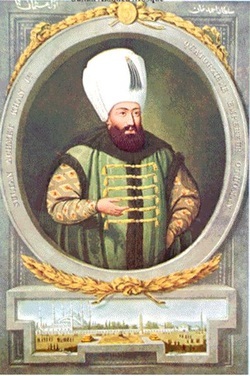 The sultan could now pray in the royal box which called hünkâr mahfil. The building was not yet finished in this last year of his reign, as the last accounts were signed by his successor Mustafa I. Known as the Blue Mosque , Sultan Ahmed Mosque is currently one of the most impressive monuments in the world. The design of the Sultan Ahmed Mosque is the culmination of two centuries of both Ottoman mosque and Byzantine church developments. It incorporates some Byzantine elements of the neighboring Hagia Sophia with traditional Islamic architecture and is considered to be the last great mosque of the classical period of Ottoman Empire. The architect has applied the ideas of his master Sinan, aiming for overwhelming size, majesty and splendour. At Blue Mosque lower levels and at every pier, the interior of the mosque is lined with more than 20,000 handmade ceramic tiles, made at Iznik city (Nicaea) in more than fifty different tulip designs. The tiles at lower levels are traditional in design, while at gallery level their design becomes flamboyant with representing flowers, fruit and cypresses. More than 20,000 tiles were made under the supervision of the Iznik master potter Kasap Haci,and Baris Efendi from Avanos,Cappadocia. The price to be paid for each tile was fixed by the sultan's decree,due tile prices in general increased over time. Result is, the quality of the tiles used in the building decreased gradually. Their colours have faded and changed and the glazes have dulled. The tiles on the back balcony wall are restorated tiles from the harem in the Topkapı Palace, when it was damaged by fire in 1574. The upper levels of the Mosque interior is dominated by blue paint. More than 200 stained glass windows with intricate designs admit natural light. On the chandeliers, ostrich eggs are found that where meant to avoid cobwebs inside the mosque by repelling spiders.The decorations including verses from the Qur'an, many of them made by Seyyid Kasim Gubari, regarded as the greatest calligrapher of his time. The floors are covered with carpets, which is donated by faithful people and are regularly replaced as they wear out. The many spacious windows confer a spacious impression. Each exedra of the Mosque has five windows, some of which are blind. Each semi dome has 14 windows and the central dome 28 windows(four of which are blind). The coloured glass for the windows was a gift from the Signoria of Venice to the sultan. Most of these coloured windows have been replaced by current modern versions with little or no artistic merit. The most important element of the Mosque interior is the mihrab, which is made of finely carved and sculptured marble, with a stalactite niche and a double inscriptive panel above it.Adjacent walls are sheathed in ceramic tiles. But due to many windows around it make it look less spectacular. To the right of the mihrab is the richly decorated minber, or pulpit, where the Imam stands when he is delivering his sermon at the time of noon prayer on Fridays or special holy days. The mosque has been specially designed so that even when it is at its most crowded, everyone in the mosque can see and hear the Imam. The royal kiosk is situated at the south-east corner comprises a platform, a loggia and two small retiring rooms. It gives access to the royal loge in the south east upper gallery of the Blue Mosque. These retiring rooms became the headquarters of the Grand Vizier during the suppression on the rebellious Janissary Corps in they year of 1826. The royal loge (called hünkâr mahfil in Turkish) is supported by ten marble columns. The many lamps inside the Blue Mosque were once covered with gold and gems. Among the glass bowls each one could find ostrich eggs and crystal balls. All these decorations have been removed or pillaged for museums in Istanbul. The great tablets on the walls are inscribed with the names of the caliphs and verses from the Quran, originally by the great 17th century calligrapher Ametli Kasım Gubarım, but time by time they have frequently been restored. The façade of the spacious forecourt was built in the same manner as the façade of the Süleymaniye Mosque in Istanbul, except for the addition of the turrets on the corner domes. 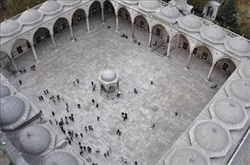 The court is about as large as the mosque itself and is surrounded by a continuous vaulted arcade. The central hexagonal fountain is rather small in contrast with the dimensions of the courtyard. The monumental but narrow gateway to the courtyard stands out architecturally from the its arcade. Its semi-dome has a fine stalactite structure, crowned by a small ribbed dome on a tall tholobate. A heavy iron chain hangs in the upper part of the court entrance on the western side of the Mosque. Only the sultan was allowed to enter the court of the Blue Mosque on horseback. The chain was put there, so that the sultan had to lower his head every time he enter the court in order not to get hit.It was done as a symbolic gesture, to ensure the humility of the ruler in the face of the divine. The Sultan Ahmed Mosque is first one of the two mosques in Turkey that has six minarets.Second one is the Sabancı Mosque in Adana. When the number of minarets was revealed, the Sultan was criticized for being presumptuous, since this was the same minarets number as at the mosque of the Ka'aba in Mecca.He overcame this problem by ordering a seventh minaret to be built at the Mecca mosque. 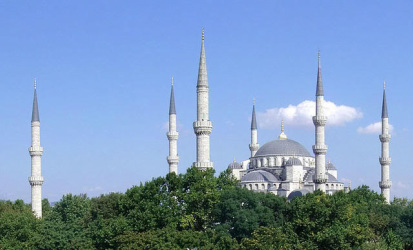 Four minarets stand at the corners of the Blue Mosque. Each of these fluted, pencil-shaped minarets has three balconies (Called Şerefe) with stalactite corbels, while the two others at the end of the forecourt only have two balconies.Before the muezzin or prayer caller had to climb a narrow spiral staircase five times a day to announce the call to prayer. Today, a public announce system is being used, and the call can be heard across the old part of the city, echoed by other mosques in the vicinity. Large crowds of both Turks and tourists gather at sunset in the park facing the mosque to hear the call to evening prayers, as the sun sets and the mosque is brilliantly illuminated by colored flood lights.